DEF-200-B/Std Standard Reliability Direct, Inc. Your Direct Source for Reliability, Maintenance, Test & Measurement! Overview: Non-destructively measures a wide variety of applications using proven ultrasound technology. Measures coating thickness over wood, concrete, plastics, composites and more. Advanced models measure up to 3 individual layer thicknesses in a multi-layer system and features a graphic readout for detailed analysis of the coating system. Proven non-destructive ultrasonic technique conforms to ASTM D6132 and ISO 2808 and SSPC PA9. *Range limits apply to polymer coatings only. **For multiple layer applications only. Dependent on material being measured. All gauges come complete with probe, precision plastic shims, protective rubber holster with belt clip, couplant, 3 AAA batteries, instructions, nylon carrying case with shoulder strap, Certificate of Calibration traceable to NIST, two (2) year warranty. 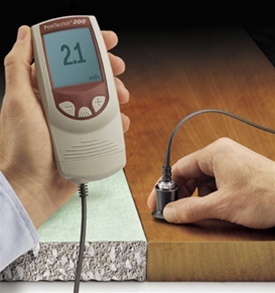 Optional Accessories: A variety of accessories are available to help you get the most from your PosiTector 200 Ultrasonic Coating Thickness Gauge. IR Printer receives data from all PosiTector 200 models via wireless infrared.
? Receives data via an invisible infrared beam. Certified Thickness Standards are ideal for checking calibration and operation of coating thickness gauges and are an important component in fulfilling both ISO and in-house quality control requirements. All standards are supplied with a certificate of calibration showing traceability to NIST/NPL. AC Power Cable for continuous operation. This kit supplies several alternate power solutions for your battery-operated PosiTector (6000, DPM, 200 & UTG). They allow the gauge to operate continuously without the need for batteries. Use the cable alone to connect a PosiTector to your PC's built-in USB port that acts as a continuous power source. Or connect the cable to the included power adaptor which plugs into any AC wall electrical outlet, 110 or 220V. A selection of electrical plugs is included which are capable of dealing with most country?s outlets.